The first Guildford Barracks was built on the Friary Estate. This lay at the western end of Guildford, north of North Street and just outside the borough boundary up to the 19th century, and occupied all the land between Woodbridge Road and the river roughly as far as the present Cattle Market. From the 13th to the 16th centuries it had been the site of a Dominican Friary. After the dissolution of the Friaries by Henry VIII, its history is confused, but in 1624 the site, described as the 'vacant site of the late house of Friary Preachers, in or near the town of Guildford', was bought by the Earl of Ammandale, who built a new house called The Friary, of chalk with squares of flint, to which a portico was added later. 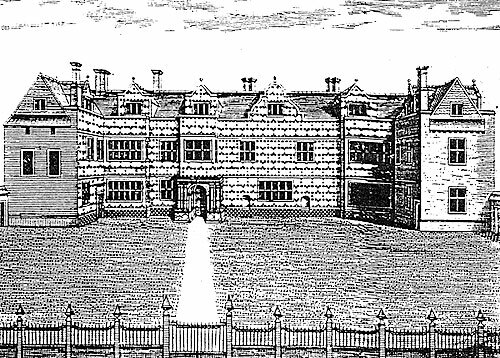 It was occupied by a series of tenants until it came into the hands of the Onslow family in 1736, after which in 1791, according to a contemporary guide, part of the house accommodated the judges, "in the genteelest manner" during the Assizes, while the other part was converted into "a genteel boarding school where young gentlemen are grammatically educated under the care of Mr George Pottor". When the Judges were not there a large room was frequently used for assemblies and public breakfasts, a quaint 19th century form of amusement, before the days of cereals and toast. In 1768 a great ball was held there "as well poor as rich voters" for about 400 persons. With the outbreak of the French Revolutionary War this Friary house and estate lost its peaceful civilian character and became the home of soldiers.